I’ve lived, died, and lived again many times, and with each death has come some knowledge of how to do things better. Here’s what I wish I’d known from the start. Bear in mind that it really does get easier. Obviously, if you bought the game, you’re probably not going to abandon it after spending the first hour getting repeatedly smoked. But I’m still going to urge you not to do that, because Dead Cells really opens up the more you play it, and the developers have built in a bunch of clever ways to make you slightly more powerful with each go-round. Stick with it for a couple hours, and you’ll see. Avoid shields, at least at first. You can play with red melee items or purple ranged/magic items, or you can equip a green shield item. Feel free to experiment with what you think works best, but in my experience shields are less broadly useful than melee and ranged weapons. The dodge roll provides so much leeway for avoiding attacks that I haven’t run into any scenarios where I think I would have done better with the ability to block and parry. Shields strike me as a high-level tool for people who’ve really worked out the timing on enemy attacks. Stick with swords and bows to start with. Make regular use of your items. You’ll quickly pick up some grenades and traps, and should hopefully have a full loadout by the middle of the second area you visit. I spent a while not understanding how often I could use those tools, and thinking of them more as weapons for special occasions. That is not the case! In fact, I’ve come to design entire builds around the tools I have equipped, and have cleared tough levels relying almost entirely on turrets. The Cross-bo-matic, which shoots arrows like a machine gun, is particularly great, and I like combining it with a bear trap to keep enemies stuck in one place. Pop up to a new level with some enemies, drop a turret, then drop down to the chain or pipe leading up to the platform, and you’ll clear the room without taking a single hit. It’s a great way to make progress while you’re still mastering up-close fighting. In between levels you get to add up to three mutations, which give you major bonuses for the remainder of that life. I find the melee and tool recharge mutations are the most useful for my playstyle, given that I like to throw out a lot of turrets. The game is arranged so that you can pick three mutations by the time you fight the first boss, so pick your loadouts and mutations carefully. Stun, slow, or freeze enemies at every opportunity. This is a broad gameplay tip: everything moves fast in Dead Cells, and fights can quickly escalate way beyond where you thought they would. You drop on one dude, and another dude pops out of the ground, and then whoops, two birds come flying in, and you’re still dealing with the first dude! The best way to deal with all of that is to use items that slow or freeze your enemies. I try to always keep at least one freezing item on me, whether that’s a frost spell, an ice bow, or an ice grenade. But there are plenty of other tools and weapons that slow your foes. Your speed is one of your greatest advantages, and slowing your enemies down only enhances that. Ground-pound every time you drop. The Dead Cells ground-slam is one of the most satisfying moves I’ve come across in a long time. That’s a pretty good reason to constantly do it, but if you need another: You can ground-slam from any height and land intact. If you jump from a high platform without doing a ground slam, you’ll get stunned on landing. That can leave you open to attacks, which can end a promising playthrough in a pretty depressing way. If you’d have just ground-pounded all the time, it never would have happened. 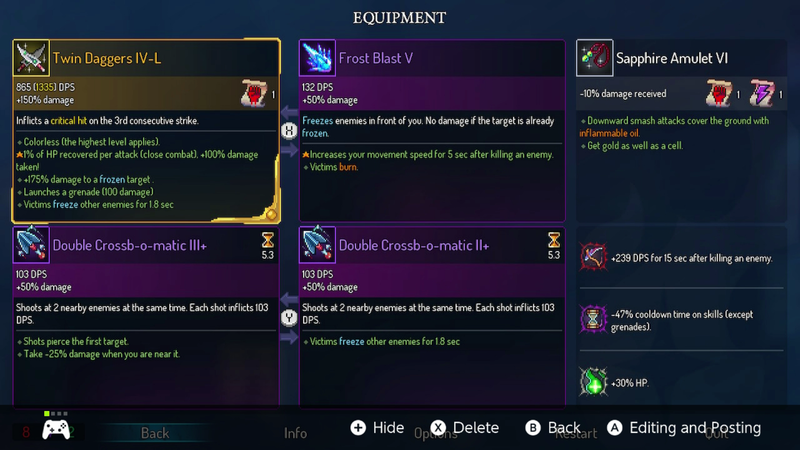 Like ground-pounding, breaking through doors in Dead Cells is also very satisfying, and you should also do it all the time for similar reasons: Besides being fun and looking cool, it provides a gameplay benefit. Specifically, it stuns enemies on the other side of the door, which can be super helpful for clearing rooms fast. They can’t kill you if they never get a chance to attack. Use the high (or low) ground. 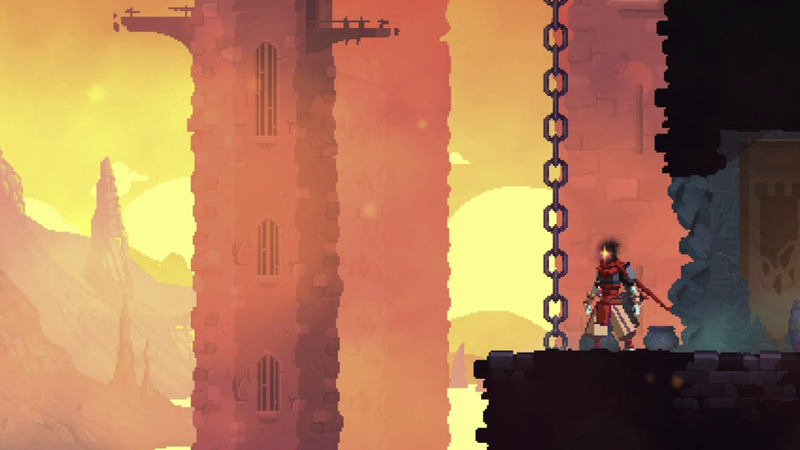 Few enemies in Dead Cells will climb up after you, nor will they drop down to a lower level. With a few exceptions, they just patrol their little area. You should mercilessly use that to your advantage, either by hopping to a safe spot to heal or by planning ambushes from on high. Do be aware of the exceptions, though: Flying enemies will chase you all over, teleporting enemies like second-stage elites. The dual-blade guys in the Promenade of the Condemned will follow you wherever you go. Some projectiles will drop down onto a spot you thought was safe. For the most part, though, it shouldn’t be that hard to find a safe spot. When spending cells, start with the cheap stuff. You’ll have to spend all your cells in between levels, and at first it can be hard to know what to focus on. My advice: get the first two health upgrades, then just buy whatever’s cheap. Some of the best upgrades, including the later potion upgrades, require you to unlock a certain number of items first. Easiest way to get those is to unlock the lowest-cell items, so start with those. There are three upgrade runes that’ll open up new paths. There are three runes in the game that will help you reach new areas and open new paths though the game’s levels. I won’t spoil what they are or how to get them exactly, but here’s a tip: you have to unlock them in order, and you have to use the previous one to get the next one. By following the path that each new rune unlocks, you’ll eventually get to a level with an elite enemy that has the next rune. (For example, you can only reach the Toxic Sewers with the vine rune.) So, always be looking for new areas, particularly new areas that you can only reach using a rune you just unlocked. At least at first, clear out the entire opening level every time you restart. It won’t be long until you’re breezing through the first level in the game, the Prisoners’ Quarters. However, just because you can get to the next area super fast doesn’t mean you should. Yes, you could race to get to the timed door at the beginning of the promenade or the sewers, but in the early goings, I recommend taking your time and clearing out the entirety of the beginning area first. You’ll probably die a lot in the second areas, and every enemy you kill in the opening area has a chance of dropping a cell you can spend to get more powerful. You’ll also find a number of upgrade scrolls, which are crucial for lasting a long time. First get a red scroll, then a green one. In general I focus on a mix of red and purple upgrade scrolls, since I mostly use melee weapons and purple trap tools. I always take at least one green upgrade scroll, however, because it gives a 60 per cent HP boost. After that, focus on whatever you please. Keep a lookout for the wall bricks you can break for health and money. In every level there are hidden runes in the walls that, should you break them open, will give you a health or gold item. Keep an eye out for these! In fact, just attack corners whenever you run into one. A lucky health item drop can be the difference between using or not using a charge on your potion, which can be the difference between surviving a level and blowing it near the end. And those are my tips! Now that you have read them, I’m sure you’ll make it to the final boss on your first try, no problem. Good luck.